Considering the number of temples it hosts, Odisha can also be called the land of temples. Yes, you can find each and every corner of the state adorned with a monument in the form of a temple. Ranging from the period before Common Era to the recent decade, you can find hundreds of religious sites and temples within its boundaries. One such temple is Brahmeswara Temple, which is said to be one of the oldest and most beautifully designed temples in the region. Located in the capital city of Bhubaneswar, Brahmeswara Temple is one of the its kind and hence, it is a must-visit tourist spot for every traveller. Read on to know more about this splendidly carved and richly designed ancient temple of Odisha. With a tropical savanna type of climate, the region in and around Brahmeswara Temple experiences hot and humid summers and hence, it is least-visited during the summer season. However, for Hindu devotees and local tourists, it remains a year-round destination. If you desire to explore the beauty of the temple and its nearby spots in a cool and pleasant environment, then the best time to visit is from October until the end of March. Located in Bhubaneswar, Brahmeswara Temple is dedicated to Lord Shiva and is said to have been constructed during the early 9th century. However, as per records and inscriptions found, it is stated that the temple came into picture during the 11th century when Somavamsi dynasty was ruling the region. Due to its historical as well as religious importance, it is one of the prominent and must-visit temples in the state of Odisha and shouldn't be missed by any traveller, especially a history lover. It is popular amongst tourists for its beautifully designed complex and intricately built structure. The use of beautiful patterns and drawings on the sandstone walls is certainly commendable. For an architecture enthusiast, the complex of Brahmeswara Temple is a sight to savour. So, what do you think of exploring this ancient masterpiece this weekend? The speciality of Brahmeswara Temple lies in its structural formation and architecturally designed complex. It comes under the category of Panchatanaya temples, which are known for their additional shrines in the four corners of the temple apart from housing the major shrine in the middle of the sanctum. The temple is also said to have been carved out of pyramidal stone structures, thereby, making it an architectural masterpiece of Medieval India. Wouldn't you love to witness such an amazing artistry? When you have already stepped on the land temples, then why stick to one spot? 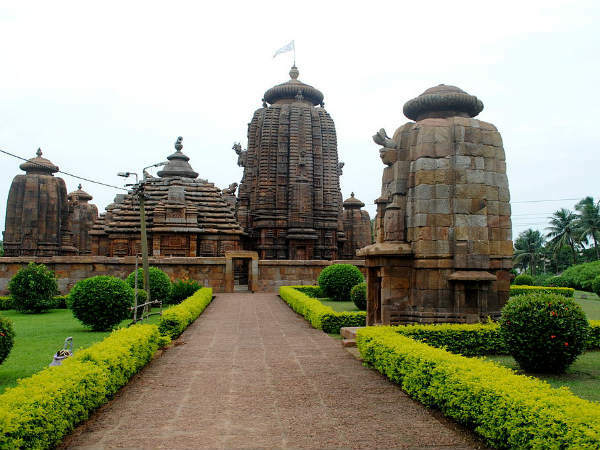 There are innumerable places of interest to explore around Brahmeswara Temple in Bhubaneswar. These major places include attractions of all kind, ranging from natural marvels to historical beauties, which include Udayagiri Caves, Lingaraja Temple, Mukteswar Temple, Odisha State Museum, Dhauli Hill and Nandankanan Zoological Park. By Air: You can take a direct flight to Bhubaneswar airport and then from there you can hire a cab to Brahmeswara Temple, which is located at a distance of about 10 km from the city centre. By Rail: Bhubaneswar is well connected to all major cities and towns by rail. Hence, it is the most convenient and fastest route to reach Brahmeswara Temple in Bhubaneswar. By Road: With a good network of roads, Bhubaneswar can be easily approached by road and hence, you can reach your destination comfortably.